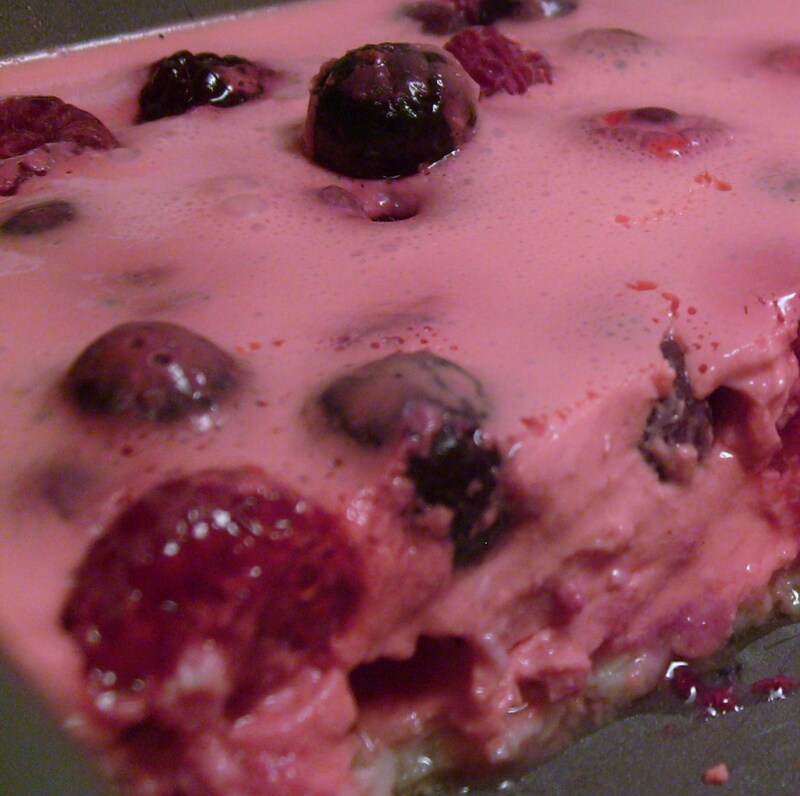 Berry Jell-O Cheesecake – Nutrition.Health.Life. Neufchatel cheese is JUST like cream cheese but with 1/3 less fat (and ultimately 1/3 less calories). I prefer this over low-fat/fat-free cream cheese because there are fewer ingredients. All of the modified-food-whatevers freak me out a bit and I’d rather go with something that has 5 ingredients instead of 22. I bought some neufchatel cheese a while back to make an herb spread (will post that recipe in the near future). It was on sale so I bought two thinking I’d use it up in no time. Then life happened and the next thing I knew the cheese’s best-by date was just around the corner. I was torn about what to make with it – while cheesecake would be good, I didn’t want to go through the hassle of making a pie crust. I searched online and found a recipe that used jell-o and neufchatel cheese – it was settled. I found a quick and easy sugar-cookie recipe for the crust and then topped with the creamy, jell-o goodness. I turned out to be quite tasty and I would make it again. However, the jell-o part is not as creamy as cheesecake, so if you are looking for something heavy this is not the recipe for you. This dessert is light and sweet – pefect for a summer BBQ. 3. Beat butter, sugar, and vanilla in a medium bowl. 4. Add the dry ingredients to the wet ingredients and beat well. 5. Press into a square baking dish (you may need a little more flour to do this). 6. Bake 8-10 minutes or until the edges are golden. 1. Mix the jell-o with the hot water until well dissolved. 3. Add in a splash of vanilla and finish beating. 5. Pour over cooled cookie crust. 6. Refrigerate for a few hours, or until set. This entry was posted in Nutrition and tagged desserts, fruit. Bookmark the permalink.